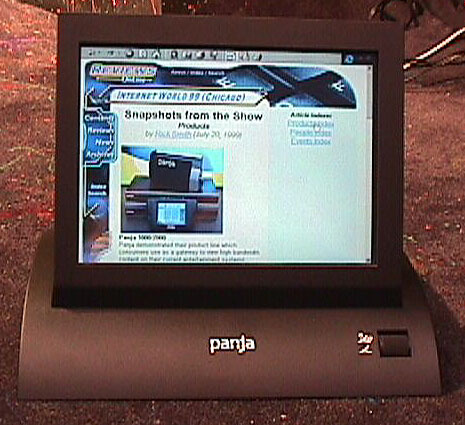 I went back to the Panja booth today, to take a picture of our Tuesday Internet World article being displayed on a Panja Information display. Yes, their technology works. 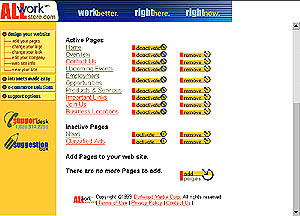 eSystems21, Inc. launched AllWorkStore.com at Internet World in Chicago on June 19th which includes a 60 minute Web site builder and an integrated suite of easy to use web tools for building a web site, e-commerce storefront or a company intranet. Customers pay a monthly subscription fee for the applications and related technical support services. Since the site is built directly on the Web, there is no need to find programmers, install software or to find a web site hosting service with credit card authorization features. AllWorkStore includes order tracking and advertising banners, so a business can start marketing and selling online immediately, with little risk. 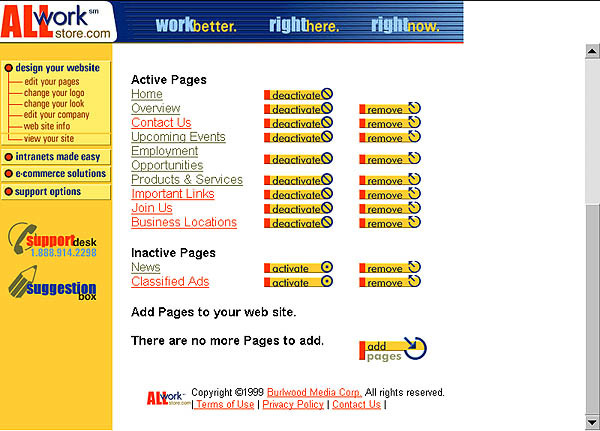 Prices range from $29-$49 per month for web sites. Intranets, with email accounts, are $6-$12, per user, per month. Store fronts, with merchant accounts, range from $79-$159 per month. Each plan includes a domain name. 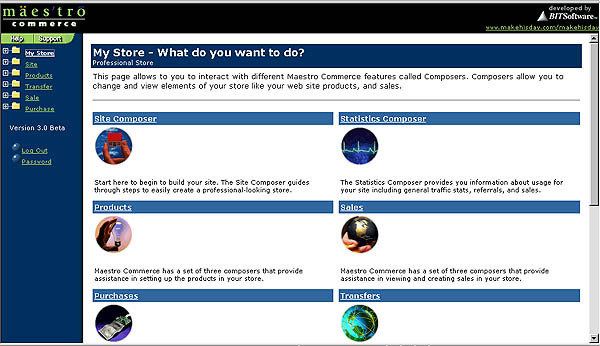 Bit Software announced the Web version of their Maestro Commerce software package about 2 months ago (June 1999) and they offer a free site that allows up to 10 inventory items, a browser based site setup/maintenance program, inventory management, non-automated credit card / check (ACH) transactions and a secure Web hosting with up to 1.5 MB disk space. For $40 per month, Express Store allows up to 25 inventory items and features automated credit card/ACH transactions with a unique domain name. The Startup Store allows up to 250 inventory items for $75.00 per month and the Small Business Store allows up to 500 inventory items, for $150.00 per month. The Professional Store allows unlimited inventory items for $350.00 per month. 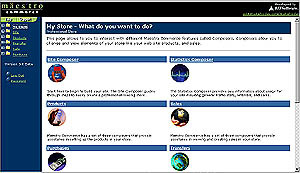 What makes Maestro Commerce most unusual is that they offer software packages with the same features and functions as the online version, for purchase. You can then have your site hosted anywhere. Three versions are available and prices range from $595 to $2,995. The Startup Edition($595) provides PC and Web-based real-time inventory management, with accounting software connectivity. The Small Business Edition adds customer contact management, multiple user support, call center support and network functionality for $1,195. The Professional Edition ($2,295) adds vendor management, pricing adjustments, PO (purchase order) management, automated PO generation, PO contract tracking, PO acceptance, user customization, commission tracking, affiliate tracking and unique partner pricing. Custom versions are also available. 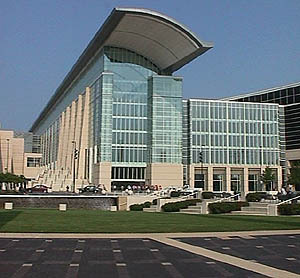 Internet World is now over and we say good-bye to McCormick Place for a little while. 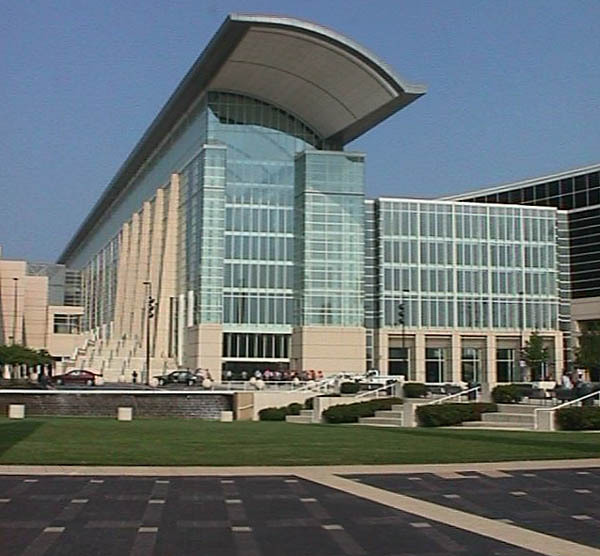 Two pictures were taken, handheld, with a Sony Mavica MVC-FD7 digital camera and digitally stitched together with Enroute Imaging's QuickStitch, to obtain the nearly square unretouched (only stitching) 600 pixel image. Digital stitching can improve architectural shots by getting more of the building into the picture. See QuickStitch review and Sony Mavica review.